Have you ever been so intoxicated that you start walking erratically, stumble away from your friends, stagger around in circles, clamber onto things that you wouldn't normally be seen near, and the next thing you know, you are strapped down in unfamiliar surroundings, unable to extricate yourself? Well, that pretty much describe what happens to ants which become infected with the famous "zombie ant" fungus - Ophiocordyceps unilateralis. Much has been written about this famous fungus which turns ants into zombies - it is a parasite which captures the same part of our psyche as the monstrosities of horror movies, and there is evidence to suggest that these fungi have been tormenting ants for at least tens of millions of years. But despite all that attention, few people have actually witnessed or documented the sequence of behaviour leading up to the infected ant's paralysis and death. But in a paper published this year, a group of researchers followed the behaviour of ants infected with the famous "zombie"-inducing fungus and compare them to their uninfected brethren. They noticed a few peculiarities with the behavioural repertoire of infected ants which stood out. While healthy ants studiously stick to the usual lanes of ant traffic, climbing into the canopy to forage with all the other busy worker ants, "zombie ants" are loners which meander around in the understory by themselves, are unresponsive to most stimuli, and frequently stumble and fall from the branches they are walking on. Essentially, the ants act absolutely drunk, indeed, the researchers described the behaviour of the "zombie ants" as a "drunkard's walk" in their paper. 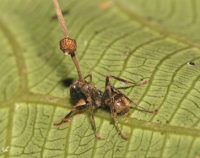 Another weird thing that infected ants start doing is their tendency to crawl all over and bite into leaves - something which healthy ants don't tend to do. There's a good reason why the fungus steers the ant towards leaves and afflict it with this oral fixation - it is preparing it for the next step in the fungus' development. For the fungus to successfully reproduce, the ant must die - but it must die in a particular position to maximise the viability and dispersal of the fungal spores, specifically in the humid understory, hanging from the underside of a leaf, about 25 cm (about 10 inches) above the ground. But once the fungus maneuver the ant into position, how does it get the host to comply and stay there? The researchers made fine histological cross-section of the infected ant's head and found that once the fungus has made the ant locks its mandible in place, it busily gets to work dissolving the muscles which control those mandibles, ensuring that the ant will be locked in a death grip forevermore. A few days after the ant dies while gripping onto, the fungal stalk emerges from the head of the ant, ready to spray its spores down to the soil below to create more drunken "zombie ants". Postscript: A few hours after I wrote this post, I found out that Carl Zimmer has already written about this study (why, of course! *facepalm*), so if you want to read his version instead, you can see it here. Today's parasite might be thought of as an "aquatic Toxoplasma" in that it also induces behavioral changes in its hosts. Polypocephalus is a genus of tapeworms that infects both shrimp (Litopenaeus setiferus) and then likely rays such as the Atlantic stingray, (Dasyatis sabina). The larvae of the cestode invade the neural tissue of the shrimp hosts, particularly in the abdominal ganglia. Studies recently showed that the more larval tapeworms a shrimp had, the more time these hosts spent walking on the substrate, as opposed to sitting still or swimming. Although the authors had predicted that they would see an increase in swimming behavior because that might expose them to predation more readily, perhaps just the increased activity in general is enough to promote transmission. Nonetheless, this was an exciting insight into a potentially new system for studying parasite manipulation of their hosts. Image from figure of that paper.